A monumental day has arrived. IGT have developed a good game and it isn't yet another copy of the 720-way series such as the Arctic-inspired Siberian Storm and the Halloween-themed Hexbreaker 2! 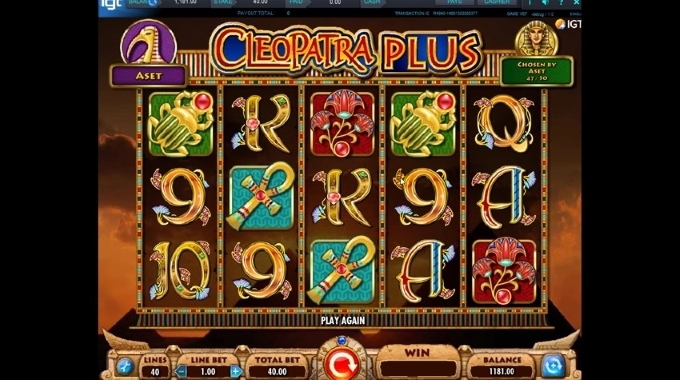 You may have guessed immediately that Cleopatra Plus is modelled on the old favourite 'Cleopatra' but our beautiful Egyptian has bestowed upon us many more of the mysteries of her ancient world in this rebooted version. We have double the lines (40) and the 2x Wilds are now stacked on all the reels 2, 3, 6 and 10 high! The symbols are familiar with the exception of the Sphinx scatter: no more "dang dang DANG!" as there have been significant improvements in the sound effects. Cleopatra Plus has a soothing and less frantic background music, but I think Cleopatra herself may have been reluctantly dragged into the modern era and is going through the transgender process; her voice seems to have dropped a few octaves and the "twice as nice" and "very pleasurable" soundbites are distinctly more masculine! How do the Cleopatra Plus features stack up? 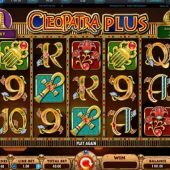 The Cleopatra Plus game is one of the 'Level Up' series and this brings us to the dramatic changes in the free spins round. First of all, there are 8 levels to achieve and any scatter you see will add 1 to the counter. At 50 you hit the second level, 120 the third and so-on. These levels increase the privileges you will pick from should you get 3 scatters and trigger the initial 5 spins at 1x multiplier. Each scatter to begin with has 1 or 2 Pharaohs so when you trigger the free spins you will have at least 3 icons to place on a map. On earning the free spins you start with 5 at 1x multiplier. You then see a map with famous Egyptian landmarks like the Temple of Karnak and the Gold Mines on which you place your 3+ icons. You can put all 3 on 1 landmark or spread them. These sites will then reveal extra spins and multipliers initially, but as you progress through the levels, the spins, multipliers and Wilds can increase in number and on the last levels you can even get a final 'super spin' where the reels are half-full of Wilds or high symbols stacked. An added bonus is that as you progress, the icons on the scatters increase in number up to 3. This means you can get 6 or more icons to lay on the map, and with increases multipliers and wild benefits along with the super spins. Should you be very daring and place say 3 icons on Karnak, and the result is a 3x multiplier, you would then have a 9x on the free games! Obviously triggering with 4 or 5 scatters will significantly add to the potential as you would have more icons. The Cleopatra Plus Return To Player (RTP) is affected by your progress. Initially just under 93% it will rise to 96.50% when you unlock all the map levels and actually advises you to use the maps on levels 7/8 when you trigger the bonus in order to maximize the RTP. The game has similarities to Netent's 'Secret of the Stones' when you place the icons, and the map on Avalon II. IGT have also added the (annoyance?) of the 'heartstopper' spin whereby 2 scatters landing in the first 4 reels will then slow them down to see if the third one will drop. So, is Cleopatra Plus guilty of trying to be all things to all players? I would have to say no because IGT seem to have got the right balance in this one. The base game plays well and the sound effects (Cleopatra sounding like Mark Anthony aside) have definitely improved. The stacked Wilds produce frequent wins in order to keep the your balance maintained over a decent period of play and bonuses have colossal potential especially as you progress. Cleopatra is Queen of The Nile again! And I am not referring to Aristocrats very own Queen of the Nile, IGT have a Queen in their own right.